Palaghar district has golden historical heritage in Vasai,Palghar and Jawhar talukas. Vasai taluka was dominion by poturgijance earlier. In the the days of Peshwa Empire, Chimajee Appa created mine and around three hundred years ago hoisted the Maratha flag in Vasai. In 1942 when ‘The Go Back Movement’ started in India for the freedom from British empire,to support this movement the great 5 martyr sacrificed their life for the country. Kashinath Hari Pagdhare of Saatpati, Govind Ganesh Thakur of Nandgaon, Ramachandra Bhimashankar Tiwari of Palghar, Ramchandra Mahadev churi of Murabe, Sukur Govind More of Shirgaon sacrificed their life for the independence from British Kingdom. In remembrance of their sacrifice a Martyr Square in the Palghar city was constructed and given the name as ‘Panch Batti’. When in the year 1930 ‘The Satyagraha Movement’ was started in the country, Many activists from Vadarai to Saatpati were also involved. At Saatapati all the foreign objects were completely banned and destroyed. In Jawhar the king named as Mukane had an independent organization, Even today in Jawhar his great Palace resembles as the witness of history. In district primarily Warli, Katkari, Malhar fisherman etc. are tribal communities. The tribal caste cultural heritage is respected and within them Warli painting and tarpa dance is an identity of their society life. 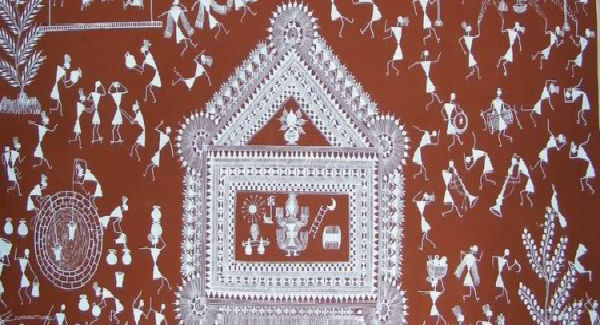 The primitive time when the man lived, from that time warli paintings is being preserved lasts 1100 years. In this art the tribal customs various activities and daily events that occur in daily life is shown. Marriage, dance and various events nature activities are shown perfectly in different nature festival. This picture are made without use of any kind of chemical colors rather Substance from nature eg, soil, rice flour, plant colors and bamboo plant staff brush are used. This is the art of painting which is based on the lifestyle of various activities of tribal people and this paintings are in demand in India as well as in abroad too.